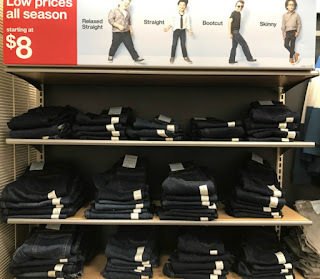 The Target Saver: Cat & Jack Kids’ Jeans, Only $5.70 at Target! Cat & Jack Kids’ Jeans, Only $5.70 at Target! This week you will find that there is a new Target app coupon: save $10.00 instantly when you spend $40.00 or more on apparel, shoes or accessories. Clip this coupon from the Target weekly ad, or find it in the “wallet” section of the Target app. No promo code is needed when shopping online; the coupon will be applied instantly at checkout.